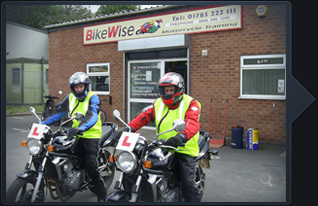 CBT Stoke on Trent – Why choose BikeWise in Stafford for your CBT training? For CBT nr Stoke on Trent, we pride ourselves on our professional, yet friendly, comfortable environment. Creating an informal atmosphere for all candidates. We only have qualified instructors for all aspects of tuition. Did you know that if you undertake a 125cc part two test you need not be in the custody of a qualified instructor? Here at BikeWise we welcome you to ask for our instructors ‘Certificate of Authorisation’, which has to be carried by all instructors whilst providing tuition. Ready to book your CBT Stoke on Trent? You are in Stoke and your closest motorcycle training school is BikeWise in Stafford or select another school by clicking below. To ensure you know were we are, you will find a location map and directions on how to get to us below (click to scroll down).